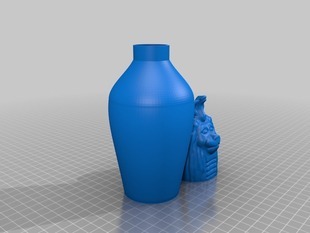 Printed up ceberus333's Canopic Jar 1. Downloaded the stl, hit 'make' and voila. I performed no clean up to the print. What you see is exactly as it printed. The lid fits the jar perfectly. Nice job Cerberus333! Printed on Replicator 2x using defaults (2 shells, 10% infill). Thanks for taking the time to post the picture and the comments.